We're still waiting for the vet's response but to us and what we hear from other people is that she is relatively small for her age. At 10 weeks she weighs 11LBS - knowing that she had a bit weight loss due to diarrhea. Both of her parents are normal size GSD, but perhaps a gen in her family may caused her to be the size she is at the moment. She is very active, happy, and eats like ... (well, you know). My question is, may her growth rapidly increase at one point - similar to some teens we see? It's not unusual for the smaller puppies in a litter to easily catch up with their litter mates once they get in their new homes. Plus, the whole issue of diarhhea can make a difference too especially in a young dog. So don't worry. Chances are high that she'll catch up. Keep her on the best food that you can, make sure her vaccinations are up to date and have lots of fun with her. Good luck with your new German Shepherd puppy Pebbles. Thank you for the comments, I really appreciate it. At three months, we currently have her 1 month, she is weighting 26lbs. She caught up pretty fast since I posted my question. How cute is that name, Pebbles, I'm sure it matches her cute little face too! First let congratulate you on your new edition. Puppies are a lot of work but rewarding. This is your bonding time; hug, kiss, pet, praise her, if she does something wrong tell her No. About her weight; I heard it is not good if they grow - gain weight Too fast, not good for their developement. Give her premimun dog food from a pet store. Mia my Shepherd have been on ProPlan since she was a pup, when I got her she was on Iams which is a Premimun food, I don't dislike the brand but I'm a Purina person. 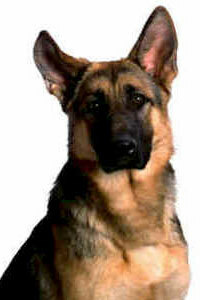 All our dogs were Purina dogs, they live long happy and healthy, have beautiful coats and sparkling eyes. You need to discuss Pebbles's weight with your vet, she will gain weight, again, not too much too fast. Take pictures so you can see her progress. Be careful with her ears, if carthage breaks the ear won't go up, so if she is scratching her ear too hard stop her. As she is teething her ears will be lopsided and floppy, then one straight up and down, then the other ear same way. Then one day, boom, they are both up. Try not to worry too much (easier said then done) she will grow big and strong, she will be your Protector, that's what Shepherds do Protect it's in their blood. Take care of Peebles and she will take care of you!